The village lies 13 km north of Csíkszereda in the valley of the Rákos Stream. Csíkvacsárcsi is affiliated to the parish of Csíkrákos. Csíkrákos, Csíkgöröcsfalva and Csíkvacsárcsi form together the Parish of the Name of Virgin Mary. The chapel of Vacsárcsi has been built in 1711 by archdean János Mátyás, born in Vacsárcsi and acting as a canon. In 1982, this chapel was extended into a modern-style, modern church by the collaboration and persistent labour of the population and of its leaders. Here can we admire the altar-piece “Transfiguration of Christ”, painted by Beczássy Antal, a talented artist from Csíkszereda. The remains of the Sándor Mansion are also attested in the village (Being mentioned in the 16th century) (along the Rákos Stream). The ruins of this mansion are considered monument, figuring in the official register of Hargita County as an archaeological reservation. Allegedly, the Szekler Chronicle of Csík was written here in 591533. The first hand-copy of it was sent to Aranka György by Farkas Nepomuk János from Csíksomlyó in 1796. It was first printed in 1818. Our novelist Jókai Mór also mentions it in his novel entitled Bálványosvár. A number of people, among them Szabó Károly and Orbán Balázs have taken it seriously. However, Jerney Károly and Nagy Géza denounced it as a swindle, a hoax, a forgery. Scientific researchers, due to the influence Szádecky Lajos did not take the chronicle as an authoritative document the chronicle and from 1905 on have not taken it any more as a „mysterious national value”. Ajnád is situated to the north of Csíkszentmihály and it has almost grown together with the latter. It can be approached along the no. 124 county road. It lies 22 km north of Csíkszereda, formerly had been the fourth decuria (village part) of Csíkszentmihály, with the name of the Decuria of Ajnád. Its name reflects Turkic origins (ayna meaning looking glass in Turkish). But it might mean contraction of the words ”alj-nád”, (literally: bottom-reed) meaning a marshy, lower-situated place. Its Baroque chapel, surrounded by stonewall, having the size of a church, was built in 1846 to the location of the former Gothic chapel. The paint coating covering the Holy Hungarian Crown that had been applied in 1936 for the order of the authorities of that time, was purged in 1940. Lóvész lies 25 km far from Csíkszereda, 13 kilometres from the bifurcation of Rákos, at the end of the County Road Nr. 124. It is a typical alpine settlement, lying on the crest. The railway section crossing its territory, was given into function at 18 October, 1897. The viaduct, constructed in 1897 bridges the valley of Karakó-stream, in a height of 64,44 m. This enrolled it among the highest viaducts of the Austro-Hungarian Empire. It was blown up in both World Wars; it gained its actual form in 1946. The total length of the railway tunnel from Görbepatak (Lóvész) in the vicinity of this viaduct has a total length of 1223 m. This was the location where unworked quarry-stone was used to walls and for the vault support. The Italian stone-masons working at this construction have manufactured/built a stone pedestal of andesite of Hargita in the memory of Elisabeth, Empress of Austria and Queen of Hungary, which presumably supported the half lengthportrait of Sissi. Livezi is an alpine settlement belonging to Csíkszentmihály from administrative point of view. 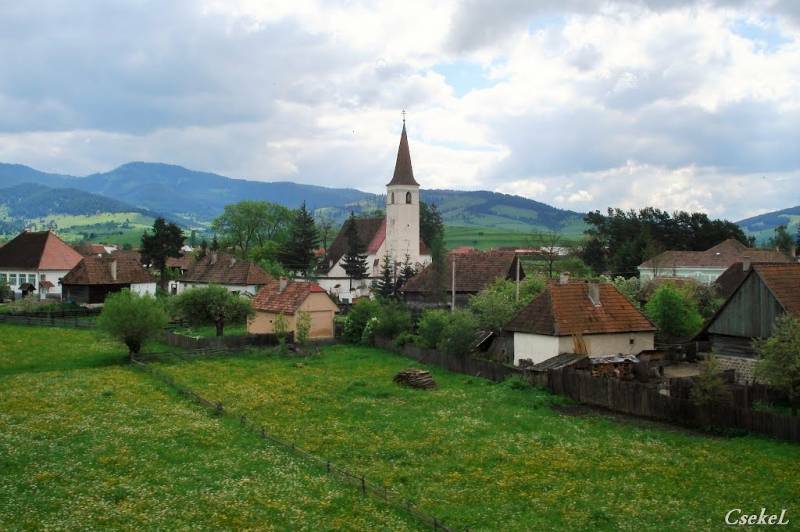 It is the only Romanian village of the Ciuc country. The vast majority of the locals work at the railway. It was formed at the beginning of the 18th century, when the inhabitants have been settled here from Moldova. The Livezi Peak rising to the northeast of the village is 1,288 m high. Through the 100 m higher Bocs Peak we can reach Kerekbükk (1,405 m) then Naskalat (1,550 m). The houses of this house are placed into forested surroundings.